Last year, I quit teaching college students how to write and got a job at a new little grocery store beneath a wellness center in my town. I didn’t quit teaching FOR the market job, but it’s helping me cover bills until I do what I really want to do: TBD. But soon my boss decided to label almost everything with index cards, and the grammatical dilemmas rocketed. Banana’s, Carotts, Mazarela, Baking Supplys, Picinic Baskets, Yogart—even when “yogurt” is clearly printed on the Chobani container. They say if you don’t speak up, you get throat cancer. But I keep my silence. When tape wears out and the cards fall off, I write new ones, hoping to teach by example. But when my lovely “Bananas” sign falls, a new one appears: “Bananana’s,” that tiny fourth ‘a’ wedged in like a splinter into my heart. In other words, don’t be such a perfectionist. What’s the big deal? Carotts and mazarela can both be eaten at picinics. Write, and write more. Write imperfectly, even when you know better. Trust your readers’ capacity to overlook. Be kind to yourself. Lesson two: Embrace other people’s contradictions. Other people’s contradictions = writing material. The market is Amish-owned and operated. I’m the only non-Amish (aka “English”) employee. Before the market, my impression of the Amish was of unsmiling faces pale between black hats and dark beards, staring straight ahead from the buggies we would pass in Lancaster County on the way to my grandma’s house. We saw Amish teenagers on scooters, one leg shoving the blacktop over miles of country roads; we saw little girls running in their yards wearing bonnets and aprons. We counted the Amish houses by the plain green shades pulled halfway down each window. No curtains, no pastels, no frills, no electricity—only cows, the Bible, and hard work. But seventeen-year-old Miriam has and uses a smart phone. She packs her lunch in a pink princess bag and wears Sketchers with her dress and hair net; her slim ankles and shapely, unshaven calves rise beguilingly above them. Thomas, with his long, white beard and homemade deli aprons, made a joke about bikinis one time and has often expressed his view that the mentally ill need medication, not just a better diet. He tells me stories about how traveling soldiers treated the Amish during the Civil War, stealing and ransacking; one man came into the store recently just to yell at Thomas for not fighting in Vietnam. Caleb, the owner, has had massages and Reiki treatments from women at the wellness center upstairs, and he gets a ride every weekend to Lancaster to date Amish women. I’m not sure if it’s because he doesn’t like the ones here, two and half hours northwest, or if it’s part of the effort to mix up the gene pool. He posts regularly on the market’s Facebook page. He’s read A Course in Miracles, a book of Jesus’s teachings as channeled through Helen Schucman, a psychology professor at Columbia in the sixties. He shrugs off the channeling part: “It’s not any different than the prophets from the Bible.” He’s read the entire book, all 1000+ pages of it. He reads through the Bible every year, too; it’s just a little bit of reading each night, he says. And thus, lesson three. Lesson Three: If you work steadily, stuff gets done. You’d think I’d know this already. And I do, theoretically, although I’ve rebelled against slow, steady work my entire life. I have preferred the hare’s alternating energy blasts to the turtle’s plod, eternity made visible. But here, confronted with 50-lb bags of flour or pickling spice or oat bran that must be packed into 1 and 5 lb bags, I learn that I tend to WAY overestimate how long things will take, which means I rarely attempt anything that seems big—like writing a novel or trying to publish a book. Packing monstrous amounts of basil into 4 oz containers, by the way, takes about an hour, not weeks and weeks of toil and cinders and little mice that sing and make clothes for you. Lesson Four: Confidence is key. Caleb knows nothing about food; Thomas says this is because he’s a bachelor whose mom cooks all of his meals. Thomas also says that Caleb doesn’t taste food—he just eats it. So in addition to having to explain to Caleb what a yam is (not a radish) and how long apples will stay fresh (not two years), we’ve had to explain that lumpy milk is bad milk and that hard chips are stale chips. 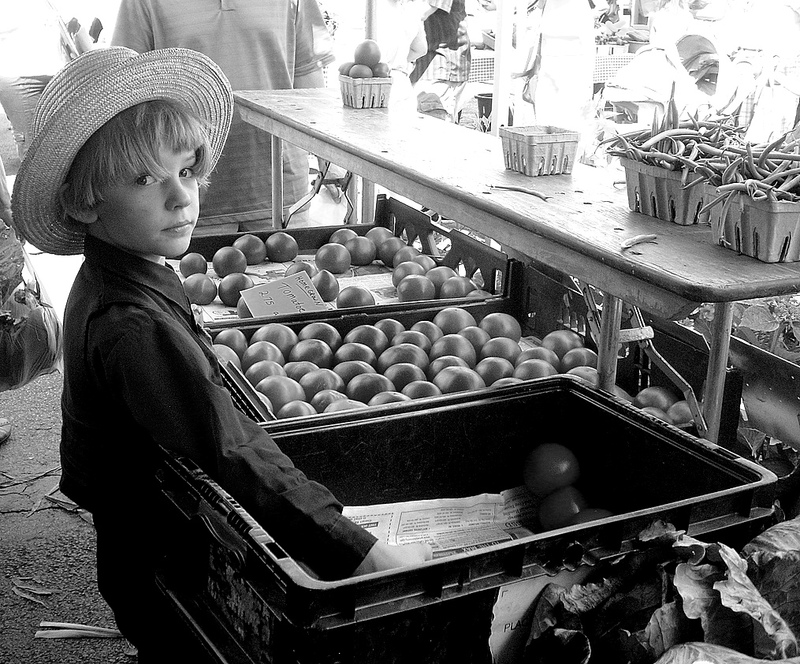 “It tastes fine to me,” Caleb says, and sells it anyway. All of this is to say that it’s been Caleb’s life’s dream to own a grocery store, and now he owns one. He makes decisions quickly and in a minute reverses them without worry. He insists that customers will buy more if all prices end in a 9. Lesson? You can do anything you want. Want to be a writer? Write! If Caleb wants to write a book one day, I have no doubt that he’ll do it promptly and with minimal worry about how it looks or sounds. That’s an editor’s job, anyway. Lesson Five: Keep your deadlines flexible. Under Caleb’s tutelage, I’ve learned the meaninglessness of the expiration date. If we haven’t sold something by 10/21/14, don’t worry! Just cross out the old date with a black marker and write in a new one, say 05/30/15. Or, play it safe and give everything we pack an expiration date of two years, whether it’s pretzels or fudge or cumin. Some writers like deadlines. I don’t like deadlines, but I need them. For example, I was asked to write this blog in August and given a deadline of February. I like this. It gives me lots of time to set and cross out deadlines along the way. The deadline doesn’t matter that much as long as sometimes still buys the final product. The final product doesn’t have to be good, as long as someone buys it. Lesson Six: Don’t worry so much about transitions. One normally wouldn’t expect to find piles of mayonnaise on the produce table, but if you have boxes of expired mayonnaise and not very much produce, why not? If one of your characters or ideas is not well-developed and you don’t know how to fix it, just write other stuff all around it. That will get people’s attention; they might even buy it. If you notice that your list of lessons is less about lessons and more about some light sarcasm, don’t worry about accounting for this shift in tone. Lesson Seven: Organization doesn’t matter. People will find what they need. Cram your book/shelves with so many words/foods that people will be forced to dig through them to find the gold. It doesn’t have to make sense! It’s better if it doesn’t! People will discover something unexpected in the process. For example, if you pack a sentence so full of words that they all jumble together like pineapple chunks soaked in heavy syrup and stuffed into a 15.5 oz dented can sitting on top of torn, stacked boxes of expired mackerel next to the pillar in the aisle off of which customers have to scrape the wooden molding to get by with their carts (and forget about handicapped access) and in the meantime you’re so tired of walking over to the deli to see if anyone needs meat and the webbing between your thumb and fingers is sore from triggering the pricing gun, then your sentence will force people to stay with it and look at it again and again, as many times as there are boxes of recalled diced tomatoes, and if anyone gives up and leaves, they’ll be dogged by the fear that they missed something really great. It’s kind of like reading the classics. Sometimes you have to get someone to yell at you to hurry up even if you’re already on your way there. Lesson Nine: It’s not rotten unless it makes someone throw up immediately. If you must hang on to an idea (or potato salad) even though the essay (or customer) is just not buying it, do so. Kill your babies, they say. But I say don’t kill them until you’re perfectly sure they are disgusting, ugly babies that make you want to throw up. Because sometimes those babies have to stick around for awhile until you stop being enamored with them. So, even though they may kill your entire essay or poem or book, let them have their way. Watch how they make your readers gag. Watch how they make your essay gag. Then, when you finally start to gag, even if it takes years, you can throw them out gladly and with relish. Lesson Ten: Freely plagiarize yourself. Just because you have expired matzos priced 2 for $1 in the first aisle doesn’t mean you can’t have another stack of the same expired matzos priced for .99 a little further down the aisle. Most customers/readers don’t look/read that carefully anyway. Go banana’s. Lesson Eleven: Ignore your critics. In fact, it might be better for you to avoid workshop-style writing all together. Even so, even when you know beyond doubt that you are completely and obviously RIGHT, the critics can still make you nervous. They can make you want to give up, to stop fighting the status quo and just stuff the shelves. In that case, you can either rally yourself or see lesson 7. Lesson Twelve: Love your creations, whether they be characters, line breaks, lines of reasoning, descriptions, or plots. It’s all illusion anyway, so relish the process and forget the outcome. Not all Amish stores operate this way (in fact, I’d bet most don’t). And even though I’m often stymied by grammatical or ethical dilemmas, I can still enjoy work if I loosen my desire to control and focus on what I like. I like using the cash register. I like cleaning fingerprints off the freezer glass. I like how Thomas sings when he mops the floor or cleans the slicer. I like getting lost in organizing the cake mixes, even when I come in the next day to find my entire system in disarray. It’s all about the moment anyway, right? I have yet to apply this attitude to writing, but I’m working on it. Lesson Thirteen: When you’re ready to quit, don’t question yourself. If you live in the flow, focus on process, stay in the moment, etc., you will know when it’s time to move on. The flow will divert, and you’ll float along with it. When that moment comes, don’t think about it, don’t open up the space for anxiety and second-guessing. Don’t worry about closure or timing or elegance. Just move on. This can apply to jobs or to essays. The brilliance of this piece is the bottomline: that people are just human, regardless of religious affiliation, amount of education, etc. In the end, there isn’t a whole lot that separates us, no matter how hard we try to be “unique” or prove how we are “different,” a.k.a. better than others. Cindy Clem, I love the always humorous way you capture human nature and truth! Keep writing. Thanks for your comment. We were so happy to feature this piece on our blog. Thanks for reading! I love this post. As one who has broken the rules of the academy and continued where my soul leads (so far, so good), it is a bolt of flowers to read about the flow taking someone to a new, life-giving place. Joe Brainard misspelled words all the time. I know this may sound like it doesn’t connect. But it does . . . . . I love this post! I had the biggest smile on my face while reading. I worked for a small business for a year (a lot of our signs were handmade) and I could really picture the store in my mind. All of these lessons are great and I appreciate your positivity throughout. My favorite was lesson 9. Your line about not killing your babies until you are absolutely sure they are disgusting was hilarious! It is definitely great advice. Sometimes I am unsure and or hate something I write, but sometimes the reader might like it or thinks that it works. The same occurs vice versa and I appreciate lesson 11’s statement on ignoring critics for that reason! First of all, I love seeing this other side of living in America. We know about Amish culture but we hardly ever get an honest look into it. It’s also nice to see the small business side of things. Secondly, there are a lot of great tips in here, but the ones I really connected to the most were three and six. Overestimating my workload and transitions are the biggest detriments to my own writing. The amount of work that goes into a novel and figuring out how to link two fantastic scenes in a way that doesn’t bore the reader seems impossible, but it’s all a matter of just sitting down and doing it. As Clem says, confidence is key, especially in a field that’s at least 85% criticism. I enjoyed reading this post because it shows that not everyone is perfect at first. Being a writer comes with certain rules. Everyone expects everything you write to be spot on with no errors. This is far from realistic, and even the greatest of writers forget a comma every now and then. I loved the fact that there was a list that related to writing but also incorporated things from her experience. Overall a great read!